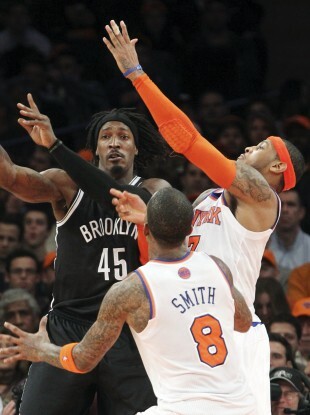 Brooklyn Nets' Gerald Wallace (45) fights for a loose ball against New York Knicks' J.R. Smith (8) and Carmelo Anthony during the first half of their game Wednesday night. NEW YORK BOUNCED back from their shock NBA loss to Houston with a win over Brooklyn, while Oklahoma City earned their 12th victory in a row. The Knicks were far too strong for their cross-town rivals with Carmelo Anthony dominating as his side powered to a 100-86 win at Madison Square Garden. Anthony, who missed the past two matches with an ankle injury, made a successful return to the line-up with 31 points, while JR Smith added 19 and Tyson Chandler had 16 and 12 rebounds. The result keeps New York on top of the Eastern Conference standings with 19 wins, three games clear of Miami, although the Heat have played three fewer matches. Joe Johnson top scored for the Nets with 17 points, but it was little consolation as they slumped to their third straight loss and eighth from their past 10 matches. The Thunder showed no signs of slowing down as Kevin Durant scored a season-high 41 points to lead his side to a 100-92 victory over the Atlanta Hawks. Russell Westbrook scored 21 points in the first half on his way to 27 with no other Oklahoma City player reaching double figures. The Los Angeles Clippers kept pace with their Western Conference rivals with a 93-77 victory over the New Orleans Hornets. Blake Griffin top-scored with 18 points, while Jamal Crawford had 17 as the Clippers cruised to their 11th win on the trot. The Memphis Grizzlies shared the scoring around with five players reaching double figures as they posted a workman-like 90-80 win over the Milwaukee Bucks. Paul Pierce, 35, became the oldest Boston player to score 40 points in a regulation game as he led the Celtics to a 101-93 win over the Cleveland Cavaliers. The Charlotte Bobcats crashed to their 13th loss in a row with Shannon Brown’s season-high 26 points leading the Phoenix Suns to a 121-104 win. The Sacramento Kings won a high-scoring affair against the Golden State Warriors with DeMarcus Cousins scoring 24 points in the 131-127 victory. In other results, the Toronto Raptors notched a 97-91 win over the Detroit Pistons, the Houston Rockets were too good for the Philadelphia 76ers 125-103, the Indiana Pacers defeated the Utah Jazz 104-84 and the Orlando Magic posted a 90-83 win over the Washington Wizards. Email “While you were sleeping: New York get the better of Big Apple battle”. Feedback on “While you were sleeping: New York get the better of Big Apple battle”.